The distance events at the USATF Track & Field Championships kick off Thursday in Sacramento, and there are clear favorites in most of the races. In an “off” year with no Olympics or World Championships, it’s all about winning, as second or third won’t win you a ticket to a larger stage. If Galen Rupp runs the 10,000, he should cruise (his qualifying mark is full minute faster than the next fastest, Ryan Vail‘s 27:44). 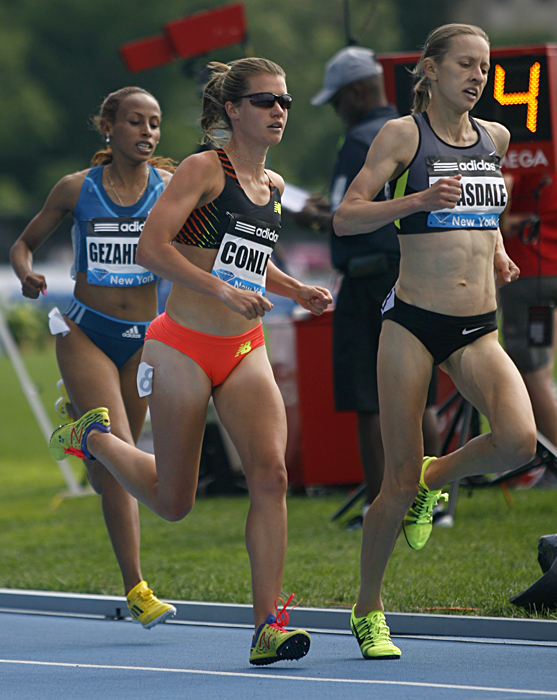 Jenny Simpson and Molly Huddle should handle the 1,500 and 5,000. Evan Jager and Emma Coburn are heavy favorites in the steeples, and Duane Solomon should take the men’s 800. The women’s 10,000 also boasts a heavy favorite in Shalane Flanagan, but this is where things get interesting. Also in the women’s 10,000, which starts at 8:20 PM PCT on Thursday night (11:20 EDT) is Sacramento’s own Kim Conley, who ran 31:48 at Payton Jordan and who more recently set a PR in the 3,000 at the adidas Grand Prix in New York. She and Jordan Hasay, who ran 31:39 at Payton Jordan, will hope to be within striking distance of Shalane and utilize their track speed towards the end. It may not be as easy for Shalane to break these two as it was for her to break the field in a hot race at U.S. Outdoors in Des Moines last year. Will Galen Rupp run the men’s 5,000, and if so, will he be challenged? The 5000 is the day after the 10,000. If Rupp doesn’t scratch after the 10,000 (and if he’s not busy attending to newborn twins), he’ll be facing relatively fresh competition. Bernard Lagat ran an un-Lagat-like 13:31 at Pre, but historically Lagat has had Rupp’s number, including at last year’s 5,000 at USAs when Rupp was seen as the favorite. Hassan Mead should also be in the mix. Missing from the race is Ben True, who is hoping to run a fast 5000 at the Diamond League race in Paris on July 5. The men’s 1,500 and the women’s 800 are both wide open. Without Matt Centrowitz, the men’s 1,500 will likely go to Leo Manzano or Will Leer, with David Torrence in the mix. Brenda Martinez and Channelle Price go head to head in the women’s 800. It will be interesting to see what Maggie Vessey will be wearing, and after her strong performance and fashion statement at the Prefontaine Classic, whether she’ll compete for the win.